At the emergency department, it is quite common to see a patient presenting with seizures. In this article, we will cover the following topics: seizures’ management at the emergency department, management and diagnostic workup for the first seizure, and epilepsy emergencies. Are you more of a visual learner? Check out our online video lectures and start your Emergency Medicine course now for free! An epilepsy emergency is a presentation that is characterized by seizures in a patient who is diagnosed with epilepsy. A seizure is an episode of neurologic dysfunction that is caused by abnormal neuronal activity. A seizure does not have to be motor. It can be characterized by a sudden change in behavior, sensory, or perception activity. A seizure might be focal or generalized. A convulsion is a seizure occurrence with motor activity. The term epilepsy refers to recurrent unprovoked seizures which can result from a known or an unknown cause. Status epilepticus is a state of recurrent/ prolonged seizures without a return of consciousness for more than 5 minutes. 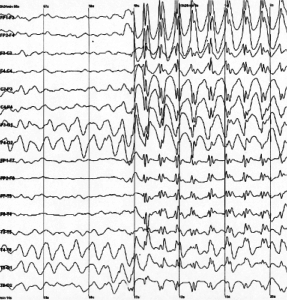 An epilepsy syndrome is a clinical entity of consistent clinical features such as the age of presentation, EEG pattern, seizure type and response to antiepileptic medications. Because a seizure is characterized by abnormal neuronal activity, one expects to find abnormalities in the neurotransmitters and their receptors in the brains of epilepsy patients. It is currently accepted that patients who have seizures have an abnormal balance between excitatory neurotransmitters and inhibitory neurotransmitters. The main excitatory neurotransmitter in the brain is glutamate. Gamma-aminobutyric acid (GABA) is the principal inhibitory neurotransmitter in the brain. An abnormality in the receptors of these neurotransmitters might result in repeated, abnormal electrical discharges which are responsible for the seizure. The semiology of the seizure is dependent on the extent of propagation of the abnormal neuroelectrical activity. New-onset seizure disorder that presents with a seizure for the first time might be caused by stroke, brain tumor, trauma, hypoxia, vascular abnormality, hypoglycemia, electrolyte disturbances, meningitis, encephalitis, and malaria. New-onset seizure disorder might also be the first presentation of an epilepsy disorder. The seizure activity mostly originates from a discrete region of the cortex in the initiation phase that is characterized by two events in an aggregate of neurons i.e. high-frequency burst of action potential and hypersynchronization. Later, the effect then spreads to other brain areas in the propagation phase. This leads to an increased level of NMDA and Calcium ions that further worsen the situation due to enhanced neurotransmitter release. Up to 200,000 new cases of epilepsy or seizures occur each year in the United States. Half of these cases will be classified as an epilepsy disorder once the seizures recur. 50,000 to 150,000 patients will reach status epilepticus per year in the United States. Status epilepticus is an epilepsy emergency. The most important risk factors for epilepsy and new-onset seizure disorder include head trauma, history of stroke, and a family history of epilepsy. The risk of a recurrent seizure after the first seizure overall is around 40%. A recurrent seizure after a first seizure will most commonly occur in the first 6 months. When a patient presents to the emergency department with a seizure, it is important to establish if this is the first seizure or a recurrent one. History of an epilepsy disorder should be excluded. If the patient has a known history of an epilepsy disorder, compliance with antiepileptic medications should be checked. Early posttraumatic seizures can occur in patients with severe traumatic brain injuries, especially if the patient developed an intracranial hemorrhage. The use of prophylactic antiepileptics in patients with severe traumatic brain injuries might have a small role in the reduction of the risk of early posttraumatic seizures. Prophylactic antiepileptics in this scenario do not affect the risk of late posttraumatic seizures. Intracranial hemorrhage, whether traumatic or spontaneous, can predispose the patient to an increased risk of seizures. The size and location of such bleeds are key factors in defining the risk of seizures. Large temporal lobe intraparenchymal bleeds are more likely to result in seizures compared to small deep intraparenchymal bleeds. Medication history is important in the emergency department setting when dealing with a patient who is presenting with seizures. Tricyclic antidepressants and isoniazid overdose can cause seizures. You should also try to characterize the seizure activity by its duration, manifestation, associated warning signs such as photophobia and interictal occurrences such as tongue biting, eye rolling and excessive salivation. Laboratory tests have a small role in the diagnostic workup of a patient presenting with seizures. It is important to exclude hypoglycemia/hyperglycemia and electrolyte abnormalities as potential causes of seizures in any patient presenting with new-onset seizure disorder. Up to 15% of those presenting with new-onset seizure disorder have an abnormal result in their laboratory testing. Women presenting with seizures should receive a pregnancy test to exclude pre-eclampsia and eclampsia, both of which occur in pregnant women. Patients with new-onset persistent fever, severe headache, altered mental status examination, and new-onset seizures should receive a lumbar puncture to exclude meningoencephalitis. All patients with new-onset seizures or those presenting with status epilepticus to the emergency department should receive a non-contrast computed tomography scan as soon as possible while at the emergency department. The rationale behind this recommendation is to exclude life-threatening catastrophic causes of seizures such as intracranial hemorrhage. Patients presenting with a first-time generalized tonic-clonic seizure who have returned back to normal and who do not have any neurological deficits on their examination should receive a computed tomography scan of the head, however, this can be done in an outpatient setting. If computed tomography is available at the emergency department, it is still recommended to screen all patients presenting with seizures even if they return to normal baseline. Patients with a history of malignant disease, immunocompromise, or who receive anticoagulation therapy and present with new-onset seizures should receive a computed tomography scan at the emergency department. Those presenting with new-onset seizures and new-onset neurological deficits should also receive a computed tomography scan at the emergency department. 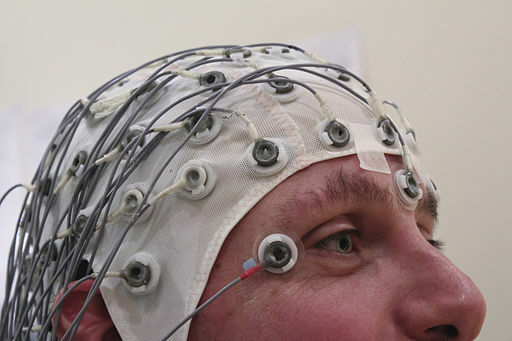 Patients in status epilepticus should also receive an phalography (EEG) study if available at the emergency department. This is important, as an EEG can identify whether the problem is focal or generalized and can provide valuable information about the prognosis. A patient with altered mental status or those in a coma might have non-convulsive seizures. An EEG can confirm this diagnosis. Aggressive control of the seizure is recommended to avoid permanent neurological damage. Identifying the etiology of the seizure is essential for the proper management of the seizures after the patient is discharged from the emergency department. Any patient presenting with a seizure to the emergency department should receive ABCs care. Temperature assessment, and blood glucose levels should be determined in all patients presenting with seizures to the emergency department. Intravenous access is recommended for all patients in the emergency department setting. Benzodiazepines should be administered intravenously, intramuscularly, or rectally; especially in those with prolonged seizures or status epilepticus. Lorazepam is the benzodiazepine of choice in managing seizures in an emergency setting. Intranasal midazolam or rectal diazepam are also two good options for the emergency care of a patient presenting with a seizure. If benzodiazepines fail to control the seizures at the emergency setting, phenytoin should be administered. Patients who do not respond to benzodiazepines and phenytoin are diagnosed with refractory status epilepticus. Patients diagnosed with refractory status epilepticus should receive barbiturates or Propofol. The aim is to limit the duration of the seizure below 5 minutes if possible, and below 20 minutes in all patients. Phenobarbital is a reasonable option in patients with refractory status epilepticus.